With over 22,000 square feet in our Randolph used furniture store, it’s always a new shopping experience at the ReStore! Certain items are almost always in stock, but we encourage shoppers to come to our Randolph store often, as our used furniture and other inventory is constantly changing and new items come in every day. Don’t miss a thing—be sure to subscribe to our e-mail list to receive ReStore updates in your inbox. Join the Fivestars Rewards program and start earning one point for every dollar you spend at our Randolph used furniture store. Not to mention sign-up bonuses and special promotions for members! Join in the store at the front desk or join online by texting HABITAT to 578-277. As a sign-up bonus on the day that you join, you will get 10% off the single largest item purchased that day. Fivestars uses your mobile phone number or email address, so you don’t need to carry a card. Track your points and get notified when you earn rewards via text message or the Fivestars mobile app. Be assured that we won’t sell or share your personal information. Points can be redeemed to take a percentage off all items purchased at once on one day. This percentage discount can be used in combination with other promotional sales. You can choose when to redeem your reward. Customers with the old ReShopper loyalty cards will continue to earn punches for each separate purchase of at least $20 (until the card is filled) while earning points on the new Fivestars program as well. 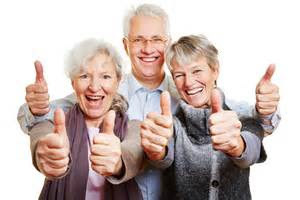 We give a 10% discount to seniors (55 or older) every Friday. We give a 10% discount every day to current and former members of the armed forces. 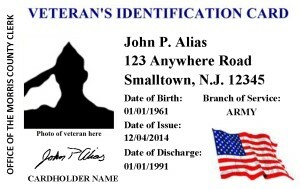 Please show military ID or the Morris County Veterans’ ID card. 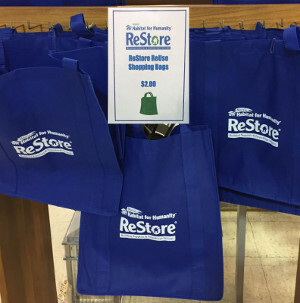 We offer re-usable shopping bags for sale at a price of only $2.00 each. Bring this bright blue bag with you on every trip to reduce the use of plastic bags. Payment may be made with Visa or MasterCard debit/credit cards or cash. Checks are not accepted. Non-working appliances may be returned for a full refund within 7 days of the purchase and/or pick-up date. Item(s) must be in the same condition as when purchased and a receipt is required for all returns. Checks will be mailed out for all refunds. No deliveries are made by the ReStore. Purchased merchandise not picked up 7 days after the date of purchase will be returned to the sales floor for resale. The purchase price will be considered a donation to Morris Habitat for Humanity.